Born November 21, 1928, in Waco, Texas, Hanna was the founder of the Novato Institute for Somatic Research and Training in Novato, California and the editor of Somatics: Magazine-Journal of the Bodily Arts and Sciences. He also authored seven books, perhaps best know for Bodies in Revolt: A Primer in Somatic Thinking (1970) and Somatics (1989). Hanna is survived by his wife, Eleanor Criswell, and three children, daughters Tad Hanna and Wendell Zitelman , and son Michael Hanna. As an undergraduate at Texas Christian University from which he received a bachelor’s in 1949, Hanna initially thought about going into theology. He continued studies at the University of Chicago, later receiving a Bachelor of Divinity and then a doctorate in philosophy. Hanna taught in Europe and several colleges throughout the U.S. At his memorial service held, Aug. 12, several people referred to his popularity as a teacher. One speaker recalled an incident while Hanna was teaching at the University of Florida. He was having car trouble and was going to be late getting to his class. He called his secretary as asked her to notify the class that he would be there but would arrive late. When he did arrive an hour and a half late, the class of 700 yoga students was still waiting for him in the ROTC quadrangle where the class met. Truly he was an engaging teacher. His commitment and involvement with his material, as well as his skill at communicating it, inspired his students. In his early seminal books, he posed philosophical questions about humanity, i.e. what is it to be human, to be embodied, to be free? Those questions run like themes though his work. They were questions he never ceased exploring. 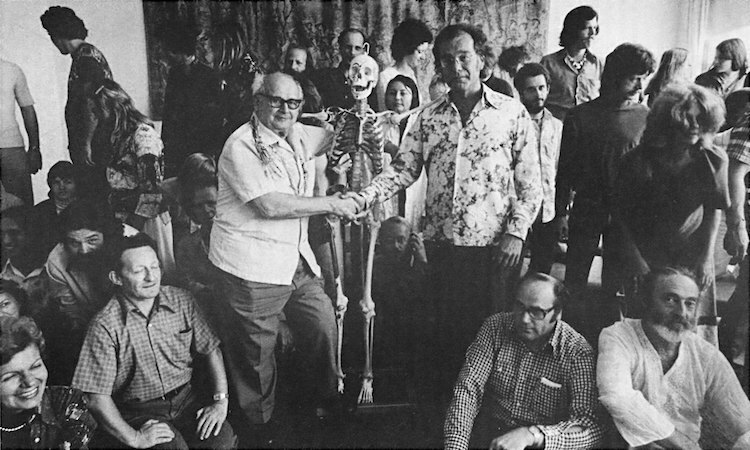 In the early 1970’s, after reading Bodies in Revolt, a well-known member of the bodywork world suggested he meet and study with Moshe Feldenkrais. As a result, Hanna studied with Feldenkrais in 1973 and 1974, and organized the first four-year Feldenkrais training program in the U.S. in 1975. He also founded the Novato Institute in 1975. Hanna considered himself a writer, philosopher and teacher, not a bodyworker. He called the hands-on work Clinical Somatic Education. It was his strong belief that real change can only occur from within and not be imposed on someone from the outside. It is the difference between working on someone and working with someone. The goal was not to change tissue but to restore awareness and voluntary control over the sensory-motor system. He believed that people were affected by a condition he termed sensory motor amnesia (SMA), and his work was designed to correct this. The concept of SMA is that if you lose your awareness of a part of your body, either through trauma or habituation, you lose your ability o move that part. Restoring awareness restores voluntary control. This can then be reinforced with simple movement patterns similar to Feldenkrais movement. Hanna often referred to F.M. Alexander and Feldenkrais as important teachers for him. According to Hanna, Feldenkrais has made a tremendously important discovery about body function, but hadn’t fully explored the implications of that discovery himself. Hanna used the analogy that Feldenkrais had opened the door to a vast new territory, but had not gone inside to explore. Hanna had gone through the door and was exploring this new territory in light of recent development in neurophysiology, and the implications were breathtaking. Feldenkrais had said, and Hanna reiterated, that there is no limit what people can learn. Hanna’s death occurred during the course of the first summer of what was meant to be a three-year Clinical Somatic Education Training. The class, having finished five of eight weeks of the training, completed the course with Eleanor Criswell facilitating. Members of the class are committed to continuing Hanna’s work. They will continue their studies through reading his writings, meeting in study groups, hands on practice and supervised internships at the Novato Institute. Plans are already in place for his class to meet again in July 1991. A list of Clinical Somatic Educators is available through the Institute. A scholarship fund was established in his memory. Those interested in making memorial donations are asked to make checks payable to Sonoma State University Academic Foundation with “Hanna Scholarship Fund” written on them. The fund will be used for scholarship in Somatic Studies. Donations may be sent to Sonoma State University, 1801 E. Cotati Ave., Rohnert Park, CA 94928. “There was only one difference between the flowers and me: the impatiens affirmed the eternity of life, and I did not. The impatiens were pure in the way they lived, and I was sullied with contradiction…I realized that, all things considered, it was the impatiens who lived life to the fullest, whereas I was living my life, hamstrung. It was not I who was superior, but they…Is total affirmation of life and growth the highest good, or is it some kind of sinful ignorance? Should I live awaiting the end that I have envisaged, or should I live expecting only life and only future? “And so I water my impatiens this summer and into the autumn. And I gaze at their happy innocence. They are my teachers, just as my mother is my teacher. And the water sinks down into the soil, giving life. It is the same soil from which I sprang and my mother sprang. And it is the same soil that will receive us both. Victoria Carmona, a student of Hanna’s, contributed to this report. From Massage, Nov/Dec. 1990, p.73.